Spirulina is a type of blue-green algae that is packed with nutritional compounds. While it has many benefits, spirulina is known to detoxify and energize the body. Read on to learn how. Don't be frightened by the word "algae." While you may not typically think of algae as food, spirulina is one type of algae that is considered a superfood because of its nutritional benefits. Spirulina is a type of blue-green algae. These are plant-like organisms that live in both saltwater and fresh water. It's deep color means it's packed with beneficial compounds like carotenoids, which are a natural antioxidant, as well as vitamins, minerals and enzymes. Spirulina is also made up of mostly amino acids, which are the building blocks of protein. Spirulina can be dried and added in powder form to foods and drinks or made into tablets or capsules for daily use. A common dosage is about 500 mg a day, but no recommended dietary allowance (RDA) has been established at this time. 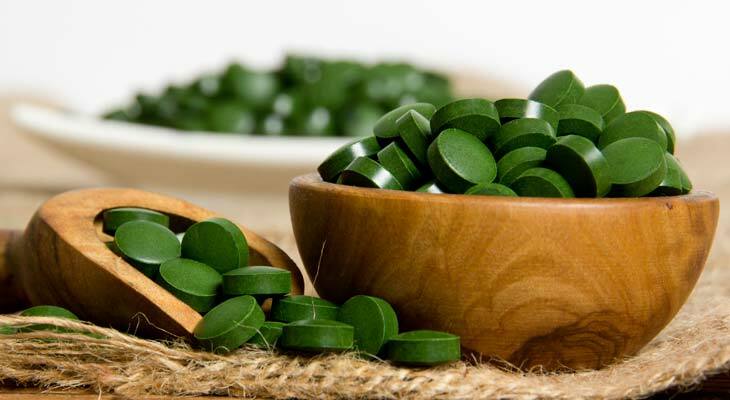 There are no reported negative side effects with spirulina, however, individuals who are pregnant, breastfeeding or being treated for an auto-immune disorder shouldn't take it without the approval and supervision of their physician. While harsh and restrictive detox methods have become more and more popular, what most people forget is your body naturally cleanses itself on a daily basis -- just one of the countless amazing things it does. Spirulina may support the organs of the body that promote detoxification, like the kidneys and the liver, to remove heavy metals and other built-up toxins. Benefits of detoxification include less bloating/water retention, improved digestive function/regularity, a stronger immune system and clearer skin. The best part is spirulina does this without causing uncomfortable side effects, like diarrhea or blood sugar spikes and crashes. Drink plenty of water -- at least eight full glasses a day. Eat a predominantly plant-based diet full of colorful foods. Avoid foods that are processed, fried or made with white flour and sugar. Add citrus to your water to reduce bloating. Sweat every single day by exercising. Try an Epsom salt bath at the end of the day. The most popular ways to increase your energy these days include coffee and energy drinks. The problem with these is they contain stimulants and often a lot of sugar. These ingredients cause your blood sugar to spike dramatically, giving you that wired or jittery feeling, and then bring it crashing down a few hours later so you're more tired than you were before. Not to mention the fact they can make your heart race. Making some changes to your routine and supporting your body's natural energy production with something like spirulina is the way to go to feel more energized safely. The B vitamins, minerals like iron and amino acids within spirulina may assist in natural energy production so you feel more alert and able to get through your day. Exercising in the morning to stay going all day long. Eating a diet rich in protein and whole foods instead of processed ones full of sugar. Planning your meals so you eat throughout the day -- three meals and two snacks -- to prevent dips and spikes in blood sugar. Enjoying a beverage like green tea when you need a pick-me-up -- it also contains antioxidants. Sleep at least seven to nine hours a night. More clinical studies are needed to prove spirulina is effective for these purposes and others. Small studies have shown positive results, but not all have been conducted using humans. As previously stated, spirulina is generally recognized as safe for most individuals, even at large doses. Shop for spirulina supplements to help you feel your best at eVitamins! Check back tomorrow for the latest health information. For a stronger dose, this powder provides 7 g of spirulina per serving. You can combine it with water or juice and drink it or add it to a smoothie or shake so you don't mind taking it daily.